Many times, in hockey, twins have found themselves playing together on the same team. Daniel and Henrik Sedin have been captivating fans of the Vancouver Canucks since they were drafted second and third overall in the 1999 NHL Entry Draft. The faithful followers of the QMJHL’s Moncton Wildcats have been treated to the show that is the chemistry between Allain and Alex Saulnier. The American women’s hockey team is blessed with the double threat of Jocelyne and Monique Lamoureux. And in Romania, Mihai and Nicolae Horghidan have been making names for themselves playing together with Dunarea Galati in that country’s national league. It is wise to assume that a lot of these multiples have been able to show their stuff playing together. In the OHL, though, there is a pair of twins now turning heads by playing against one another… albeit on teams in the same division. A pair of fraternal twin brothers from the small town of Wilton, Ontario, Keli and Kristian Grant could say that their twinship was written in the stars. They were actually born under the zodiac sign Gemini, as their birthdays are May 25, 1993. The pair played together throughout their minor hockey careers, playing in nearby Kingston. Despite their similarities, it was in hockey that their differences were apparent. Keli is an offensively gifted right winger; Kristian is a stay-at-home left defenceman. They were, however, both smaller players in terms of height and weight. By the time they were both 16, Keli and Kristian were highly regarded for the OHL Priority Selection and, in 2009, both were selected in that year’s draft. Keli went earlier, being picked in the third round (47th overall) by the Kitchener Rangers. After a long wait, eight rounds and 163 picks later, Kristian was also chosen, being picked in the eleventh round (210th overall) by the Erie Otters, one of Kitchener’s OHL Midwest Division rivals. Remarkably, the Grants were not the only pair of twins chosen in the 2007 OHL Priority Selection. With the 29th and 37th overall picks, the Kingston Frontenacs and the Owen Sound Attack drafted left wingers Brett and Tyler Morgan, respectively. Even more impressive was the fact that they were also not the only natives of Wilton to be drafted (believe me, it is a VERY small town); in the seventh round, with the 139th overall pick, the London Knights selected Darcy Greenaway, who was playing at Lake Forest Academy in Illinois at the time. Each Grant twin had to bide his time before he made it to the OHL. Keli, however, almost made his début in 2009-10. He impressed Rangers team brass so much that he was signed to an OHL contract not long after being drafted. At the time, however, Kitchener had a lot of firepower up front, including Jeff Skinner, Gabriel Landeskog and Jeremy Morin. The Rangers thought it would be best for Keli to be assigned to their junior B team, the Dutchmen. Keli opted instead to return home and play another year of midget hockey at home with the Greater Kingston Jr. Frontenacs. Kristian, however, made a quick leap to junior hockey, joining the Kingston Kimco Voyageurs, the local tier II junior A team. One of his teammates on the Voyageurs that year was Kingston native Anthony Geldart, an overage defenceman who, like Kristian, was a twin; Anthony’s identical twin brother Kaine was in his overage OHL season with the Kingston Frontenacs after spending the first three years of his OHL career with the Plymouth Whalers. In 35 games with the Voyageurs in 2009-10, Kristian scored nine points (one goal, eight assists), and recording only ten penalty minutes; his only goal of the season came on January 31, 2010, against the Brampton Capitals. He also recorded three assists in eight playoff games. Keli also got the chance to play three regular-season games and two playoff games with the Voyageurs in 2010, as an affiliate player out of midget hockey, since league rules allow only two 16-year-old players per roster during the regular season. In 2010-11, the Grant twins tried yet again to make their respective OHL teams, each one having a solid preseason. For the second year in a row, though, Keli did not stick with the Rangers. He returned to Kingston and, just as one junior hockey door closed, another opened. He made the roster of the Voyageurs, who had lost a lot of their veterans to graduation during the offseason. He scored an assist in his first game of the season and, in his second game of the year, he scored two goals. One week after the Voyageurs’ season opener, Kristian signed an OHL contract with the Otters, keeping him down in Pennsylvania. Just like Keli did in his season opener, Kristian got an assist in his season opener, his first career OHL game, a contest against the Brampton Battalion on September 24, 2010. During his rookie season in the OJHL, Keli found himself lost in the shuffle among the veteran players on the Voyageurs. He went pointless in some games but, in others, he was stellar. On October 22, 2010, Keli made his own OHL début against the Niagara IceDogs but he was returned to the Voyageurs soon after. Nine days later, Keli had one of his best games as a member of the Voyageurs; he scored three points (one goal, two assists) in a game against the Toronto Jr. Canadiens. Much like his brother, Kristian found the jump to the next level hard on his point scoring but, due to his style of play, it did not affect the rookie Otter. His defensive game began taking great strides. In fact, Kristian enjoyed two games in November 2010 in which he was +3 in each contest. On December 10, 2010, Kristian managed to score his first OHL career goal on Igor Bobkov in a game against the London Knights. In December, too, Keli was called up again to Kitchener; he played in three games from December 29, 2010, to January 1, 2011, before he was returned to the Voyageurs. On January 14, 2011, the Grant twins had an incredible night between them. Keli scored two goals in a game against the Pickering Panthers, a contest the Voyageurs won 7-0. Kristian tallied two assists and was +4 in a 12-3 win over the Barrie Colts, a performance that garnered him third star honours. In the following few weeks after that night, both twins continued their successes. Keli scored three assists in an 8-4 win over Pickering on January 20, 2011; two days later, against the Toronto Dixie Beehives, he had his best game in his OJHL career, scoring four points (two goals, two assists) in a 10-0 victory. On February 13, 2011, Kristian played his first game against the Frontenacs in Kingston in front of his friends and family. Upon the conclusion of the 2010-11 season, each Grant twin found himself with a solid year under his belt. Keli scored 30 points (13 goals, 17 assists) in 39 games, finishing tenth in team scoring. He also had decent specialty-team statistics for a rookie, scoring four powerplay goals and three powerplay assists. Keli also had 14 penalty minutes during the season. In addition, he recorded three points (one goal, two assists) in 11 playoff games. As for Kristian, he had a rather decent OHL rookie season, scoring eight points (one goal, seven assists) in 52 games; he also had only six penalty minutes, his last minor penalty of the season coming on the same night he got his first OHL goal. Going into the 2011-12 season, after both graduated from Ernestown Secondary School in Odessa, Keli and Kristian were given yet another opportunity to play in the OHL at the same time. While Kristian once again made the trip to Pennsylvania for his sophomore season, Keli made his way from Kingston to Kitchener. He, however, did not make an immediate jump to the Rangers but he did graciously accept the demotion to the Jr. B Dutchmen. This time, he had someone he knew on the team, joining Kingston native Nathan Perry on the roster. In only his second game with his new team, Keli scored a goal and two assists in a contest against the Guelph Hurricanes. While Keli found himself on a team that was doing well, Kristian, conversely, was on a team that was underachieving. The Otters had been hit hard by graduation and struggled with inconsistency, especially in goal since Ramis Sadikov had not returned from Detroit Red Wings camp as of yet. Despite it all, October was a solid month for Kristian, tallying four assists in 11 games. On October 23, 2011, Keli made his 2011-12 OHL season début against the Ottawa 67’s. Two nights later, Keli scored his first OHL career goal and, just like his brother did the season before, it came against the London Knights. (Keli, however, scored his on Michael Houser, not Igor Bobkov, who had been traded to Kingston during the offseason.) The Grant twins then got to play two back-to-back OHL games against each other as Kitchener and Erie had a home-and-home series on the 28th and the 29th of that month; Kristian came away outscoring Keli, tallying one assist. Keli split November between the Rangers and the Dutchmen, getting another callup for a game against Kristian’s Erie Otters. In that game, which was on November 18, 2011, Keli scored his second goal of the season and his OHL career, and he was also +3; Kristian was, thankfully, not on the ice for the goal, but he wasn’t on for any of the nine scored in the game as he did not play. A concussion kept Kristian out of the lineup so he even missed another game against Keli and the Rangers a week later on the 25th. Keli leapfrogged again between the two Kitchener-based squads in December, scoring six points (one goal, five assists) in five games with the Dutchmen and two assists in seven games with the Rangers. Kristian returned from his concussion in December but, just as he was starting to regain his stride, the twinning between him and his brother resurfaced. In a game against the Owen Sound Attack, Keli suffered a concussion of his own, one that also kept him out of action for a month. On January 10, 2012, at the OHL trade deadline, the Erie Otters made a deal with the Oshawa Generals to bring in veteran blueliner Jimmy McDowell. Like when he played with the Kingston Voyageurs, Kristian found himself playing with an established defenceman who, like him, is a twin whose brother is a forward. A native of Dimondale, Michigan, McDowell’s brother Jacob has played the last two seasons in the NAHL, spending the 2011-12 campaign with the Kalamazoo Jr. K-Wings. When Keli recovered from his concussion in February, he was assigned to the Dutchmen to play the remainder of the 2011-12 GOJHL season. He scored four points (two goals, two assists) in six games, including a goal and an assist in a 7-3 win over the Owen Sound Greys on February 19, 2012. On the other hand, Kristian was having one of his most solid offensive months in the OHL in February of 2012, scoring five points, including his first goal of the season on the 20th of the month, a shocking 4-1 defeat of the Belleville Bulls. Keli finished his season with the Dutchmen with impressive statistics despite the number of callups to the Rangers. He finished the campaign with 21 points (eight goals, 13 assists) in 27 games, good enough for eighth in team scoring. Out of those 21 points, 11 of them — four goals, seven assists — were on the powerplay. He also scored one shorthanded goal, one of only five the team scored as a whole. To add, he also recorded a minuscule eight penalty minutes. 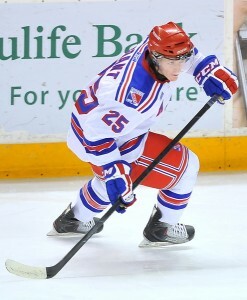 After the Dutchmen lost their first-round playoff series against the Brantford Golden Eagles in six games on March 10, 2012, Keli joined the Rangers for the balance of the OHL regular season. He has also appeared in all of the Rangers’ playoff games thus far. As for Kristian, he scored two goals in March 2012, one on the 2nd against Saginaw and one on the 7th against Plymouth. He finished the season with 16 points, three goals and 13 assists, and 18 penalty minutes in 56 games. The Erie Otters, however, did not do as well during the season as they finished last in the league standings. Hopefully, in 2012-13, the pair of 5’10”, 160-pound redhead brothers from the small town best known for a cheese factory can both be full-time players in the OHL. Keli and Kristian Grant are in their second-last seasons of junior eligibility so it would be doubly awesome if, especially since their teams meet eight times during an OHL regular season, that could come to fruition before their major junior careers end.